I could've sworn I reviewed this book last summer when I read it, but alas, it went unreviewed, which is a crying shame because this book is beautiful. And with Martin Luther King, Jr. Day coming up and Black History Month approaching, this is a book that needs to be on everyone's radar. One of the reasons kids (and adults for that matter) find history so boring is because they are forced to read "un-biased" texts void of any voice. 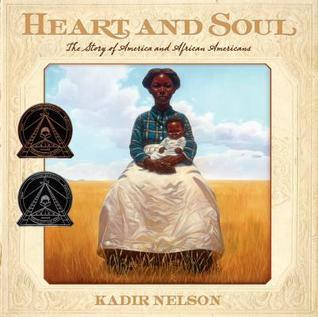 Told from the perspective of a "grandmother-like figure who would allow me to focus on major historical milestones that affected both her family and the rest of the country," Kadir Nelson creates a history of the African American experience full of, well, Heart and Soul. Once you put a book like this in the hands of students, suddenly history comes alive. I am not ashamed to admit that I teared up a couple times while reading this book. For a non-fiction text to do that is quite a feat. This would be a great mentor text to use with kids about voice and writing about history through someone else's lens.